What are the chakras? You may have seen pics of that torso silhouette guy with the coloured lights through his middle. He looks kinda cool right? Though he doesn’t really give much away as to what exactly the chakras are. The concept of the chakras can be both intriguing and a little daunting. It’s easier to understand skin, bone, and muscle because, well, we can see and feel them tangibly. But chakras require our sensitivity and awareness to move towards the more subtle, which can be a whole new funky space for us to play. Chakra (pronounced chuck-ra) is a Sanskrit word that translates as wheel. Essentially, they are energy centres within our subtle anatomy that govern the distribution and flow of prana (energy or life force) through our system. If that sounds fairly big, it’s because it is! Just as traffic can become jammed at an intersection, and the flow of blood can become blocked within an artery, energy can become blocked at chakra points. Energy moves through nadis (you can think of nadis as the highways of the energy body and chakras as the intersections), and when blockage occurs, we can experience disharmony. That might be anything from mild feelings of unrest to chronic illness or dis-ease. In yoga, as in many other eastern wellness modalities, chakras have such a massive influence on both our physical and emotional health that a balanced flow of energy (this energy is known as chi in Tai Chi, qi in Qi Gong, and ki in Reiki as well as prana) is often the main focus for some. I’ve highlighted the word balanced, because while there is the potential for energy to become blocked, there is also the potential for chakras to become overactive, which can create problems too. There are thousands of chakras in the energy body. In yoga, we focus on the six major chakras along the line of the spine, as well as the crown chakra just above the top of the head (think silhouette guy with the coloured lights). Each of these chakras relate to specific organs and endocrine glands, so they have an effect on our physical wellbeing. 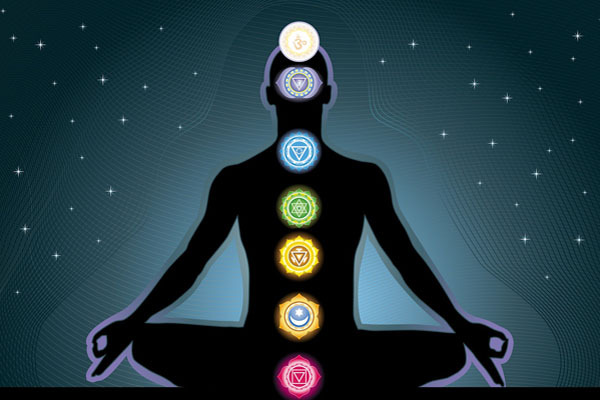 Due to the interconnected way human beings are put together, the chakras also impact our mind and our emotions. As an example, the heart chakra, located at the point in the spine behind the centre of the chest, corresponds physically to the heart and lungs, as well as the thymus gland which assists with healthy immune function. Emotionally, the heart chakra is connected to how we relate to others and our ability to feel compassion and unconditional love. Poses that encourage a balanced flow of heart chakra energy, such as back bending poses, can help vitalise our heart, lungs, and immune system as well as help us live in a more open, loving, and compassionate way. The major chakras start from the base of the spine and work up to the top. The root chakra (Mooladhara) is located just below the tailbone and relates to our connection with the physical and material aspects of life (think grounding, home, work, and your body). The sacral chakra (Swadisthana) is located around the sacrum/tailbone and is our emotional centre (think likes, dislikes, desires, and attachments). The solar plexus chakra (Manipura) is located in the spine behind the navel and is our fire centre (think willpower, determination, confidence, and self-esteem). The heart chakra (Anahata) is unsurprisingly located in the spine behind the heart centre, and is all about relationships with others (think unconditional love and compassion). The throat chakra (Vishuddhi) is located in the spine behind the pit of the throat and relates to all aspects of communication (listening and speaking). The third eye chakra (Ajna) sits at the very top of the spine, and is our centre of intuition (think inner wisdom). The seventh is the crown chakra, it sits just above the head and it has an energetic effect on our entire system as well as our connection to the cosmos. Over the coming weeks, I’ll present poses that can help balance the energy at each of the six major chakras along the line of the spine. Simply developing awareness of and sensitivity to the energy body can take our practice to a whole new level and ultimately enhance feelings of balanced health and wellbeing.